Far far away, the butterfly folk livein a kingdom of beautiful gardens. 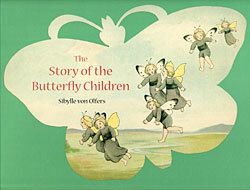 The butterfly children play, dance and sing all day long with their little brothers and sisters, the caterpillars. The children can’t wait until the first day of spring, when they will finally get their wings. But first, they must learn about the many brightly-colored flowers in the kingdom, so they can take part in the flying procession of peacock, swallowtail, red admiral and many other butterflies.